Let’s make some bacterial art! This week I’ve had the pleasure of taking part in Australia’s National Science Week. My week started in Hobart, Tasmania, where I got to hang out with science communication superstars Carin Bondar, Derek Muller (AKA Veritasium) and Destin Sandlin (AKA Smarter Every Day), performing on stage with them at an event made possible by Science Alert. After Hobart I traveled to Melbourne for a week of school talks followed by a weekend of fun getting people to draw in glowing bacteria, first at Market of the Mind and then at Living Science. The idea is that people draw a picture on a sheet of paper and then trace over their design onto a petri dish using a cotton swab and a solution of Vibrio fischeri, the bacterium that lives in symbiosis with the Hawaiian bobtail squid. 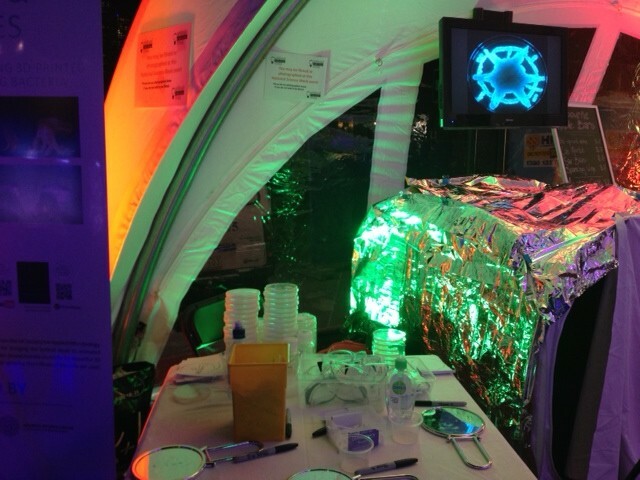 When the bacteria have grown, I then take a photo of the glowing petri dishes and put the pictures up on flickr. You can see the pictures from Market of the Mind here. And if you want to learn a little more about Vibrio fisheri and Euprymna scolopes watch the animation below or better yet get the beautiful book by Gregory Crocetti, Ailsa Wild and Aviva Hannah Reed.